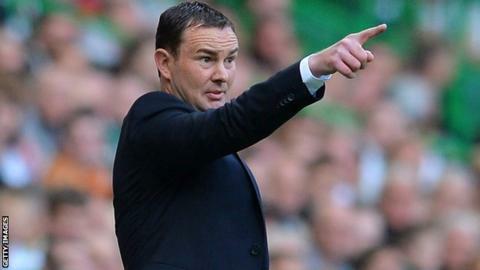 Plymouth Argyle manager Derek Adams is hopeful he can loan in players from Premier League clubs this season. Adams has made five new permanent signings since taking over at Home Park earlier this summer but says he will not make more permanent additions. "We're trying to work with the Premier League clubs," Adams told BBC Sport. "They want to have a look at them in action and try to get them to the best possible club they can do to give them game time." It is is expected that Adams will try to bolster his midfield as he prepares for his maiden campaign at Home Park. "Over the next week, two weeks, three weeks, we'll try to get some loan players in," said the former Ross County manager. "We're working alongside them [Premier League clubs] and trying to get a player in that can help boost our squad. "At this moment in time it is the Premier League, there are a number in the Championship as well, but we'll get there and we'll get those signings in eventually. "I have very good links with a lot of the clubs down here and we've got good options. "There's going to be plenty of loan players available, it's just trying to get the ones that will fit into our style of play."